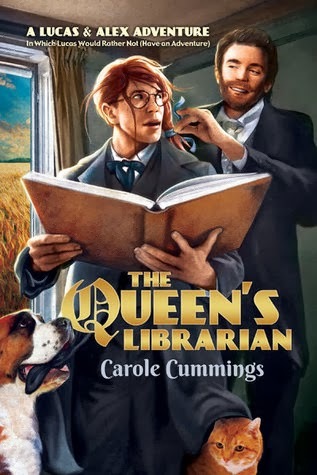 Regular readers here know that I adore Carole Cummings’ work, and to find a full length novel where she’d taken a light tone is a new treat! She describes this book as her antidote to living in a much darker character’s head for three books, and she’s brought us along for the diversion. Comedy is much harder than it looks, and sustaining it for this long a work is a skill. The author isn’t going for a laugh a minute, but she takes a gentle tone that pokes fun at everything from the Jane-Austen-ish issues the main character, Lucas, faces, to his travails with another character who becomes Quite Vexed with him. I did chuckle aloud often, and yet the underlying seriousness of their quest didn’t get lost. Lucas and Alex are an established couple, so readers looking for a classic romance of boy eventually gets boy won’t find that here. This a solid story of lovers working together to a common goal and becoming even more solid with each other. They become gently exasperated with one another, they bolster each other, and they clearly adore one another. The quest is the primary focus, a matter of great seriousness, and couldn’t be solved without both of them. Beautifully done. The secondary characters provide their own set of chuckles, and also add to the sense of the world. Usually I get a very clear sense of how a world is organized from this author, and I hope the take-away message I got of an informal sort of court much like when King George and his family lived at Kew was the right one. The crown prince gets up to the sort of adventures courtiers and chamberlains normally prevent. Lucas’ job at the library seemed like a cross between a real working job and the sort of royal sinecure one gives the shirtsleeve relatives to prevent embarrassment. He seems both quite close to the Queen and yet at a very different social stratum from the court at the same time. Perhaps the uncertainty was intentional—it does give Lucas enough time to pursue his quest. The quest itself evolves from something rather mundane but foot-stompingly important to a matter that affects the entire society, and the complications are layered on with each scene.